Brackets can also be described with a different term. Just ask a remodeler or builder about an architectural ‘knee brace’ and they’re likely to gush about its value as a functional and design component of a portico. A knee brace, also known as a gable or eave bracket, is a diagonal support placed between two right-angle planes to strengthen their connection. The gable end of a roof typically has eaves formed by lookouts; these eaves happen to be the perfect location for knee braces. Knee braces support the portico structure and can serve a dual purpose by concealing the angles. And while they provide a very important function, knee braces can play an equally important role in the overall design and curb appeal of the portico. When a portico is added to an existing structure great care is taken to blend in perfectly with the existing residence and knee braces are no exception. So, on what home styles will you find knee braces? They’re typically found on Craftsman, Northwest, French Country and Victorian style architecture. Knee braces, aka ‘brackets’, are available pre-designed or custom-made and come in a variety of materials such as vinyl or wood. • While most front stoops are approximately 5 feet wide, bracket porticos measure around 3.5 feet so they won’t cover the whole stoop. 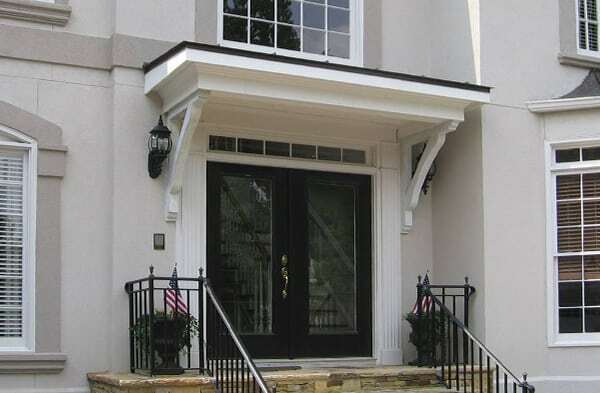 If your front entry is narrow and you own a wood- or aluminum-sided home, a bracket portico may be the perfect solution for protecting wood, trim, visitors and packages. Because Georgia Front Porch uses load-bearing brackets, the design must be somewhat shallow. Hence, they don’t have the depth that supported porticos enjoy. And the deeper the bracket portico is, the bigger the portico must be to accommodate that depth. • With Georgia laws mandating new requirements for house additions (such as porches and decks), Georgia Front Porch is only installing bracket porticos on wood, aluminum or stucco homes (vs. brick). Wondering about final details for your bracket portico? Wall sconces are commonly used for lighting and your existing stoop should accommodate a nice welcome mat and ceramic pot with flowers for a dash of color. Bracket porticos can usually be constructed in one day.